The curriculum covers from counting to fractions, decimals, and percentages. We added Algebra this fall and we plan to continue through Calculus in order that we may remediate children at the University level. If your child is working on any of those concepts, this system will work for your child. 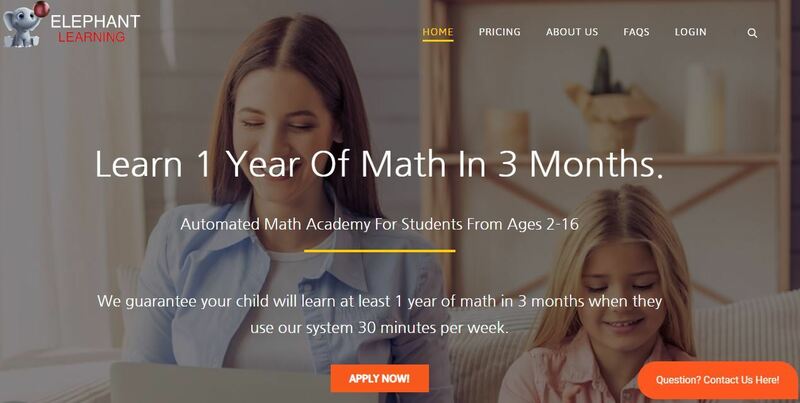 If your child is struggling with high school mathematics, what we find is that most students at upper level have fundamental misconceptions beginning at Algebra and so we wrote “up to age 16” because we believe we can begin to remediate children up to 16 years of age. Our algorithms quickly determine what children understand and do not understand. We use that information to feed children activities that were proven by third-party research to teach mathematics better than in a classroom setting. We also provide parents with information about exactly what children are working on and advice on how to take those same concepts and integrate them into play outside of the system. For example, if your child is working on counting, we may suggest playing board games. If you are a homeschool parent, you can use this to tailor your daily lessons to your child’s level so you are never going over their head. We teach math conceptually, which really means that we teach math as a language. If you have ever learned another language, you know the best way is to experience speaking in context within that language. In a similar way, we provide mathematical experiences that we can place language around. The activities build intuition in mathematics by providing a safe space for children to play with the concepts using the puzzles on the screen. It is like when you buy a piece of Ikea furniture or get a new recipe–after you’ve done it once, you get it. As children learn the concepts and develop intuition, the classroom experience is enhanced with a deeper understanding of the concepts. Math time actually becomes enjoyable when you are not memorizing procedures but rather learning a new way to solve a problem that you are familiar with. We like to say: Empowerment is understanding the concepts. Enjoyment in a classroom setting is understanding the teacher. She had memorized her multiplication tables, but she did not know how to use the multiplication to solve a problem. We see this problem very often; it is why children struggle with word problems and have troubles when they get to Algebra. The math is essentially useless for her, and math class is probably a stressful exercise in memorizing random facts. That is the reality for many of our children, and it is a cruel situation to be in. It is why almost half of the first and second graders report having math anxiety. They tell themselves they are not a “numbers person” and decide not to learn math. Children understand later in life how to use multiplication to solve these problems, and that is the saddest part: they just did not know when it could have made a difference. These concepts are not difficult to grasp (nor are they innate), and our software presents activities that are known to teach these concepts in a safe environment where there is no judgment or biases. We allow children to develop their own intuition around mathematics. Regardless of your child’s background or even if they have learning impairments, all children are able to learn the language. All children can understand the concepts of mathematics. It is simply just a matter of reaching them at their level and building up from there. Let’s get started, go to our homepage https://elephantlearning.com and click Get Started to begin enrollment.